Cockburn: When I was little, I wouldn’t go to sleep without my rubber knife hidden under my pillow. The sinister darkness under the bed could produce any number of monsters while I slept. The scary things under the bed moved to deeper and subtler places with the passage of time, but the love of a good knife only grew. As a confirmed packrat, I end up with small-to-modest collections of things I like: bags and backpacks, jackets, comic books, DVDs U.S. quarters with states on them. And knives. Or, let’s say, edged implements. Some of them are agricultural in intent (e.g. old sickles). Some are art pieces, some utilitarian, some historical or exotic. The unifying factor is the beauty of form and function embodied in things with blades. 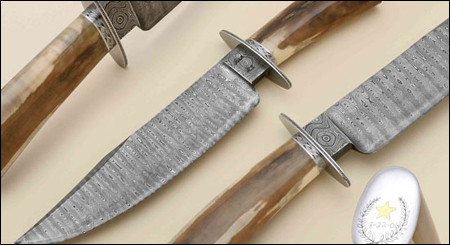 There are a few made by high-end cutlers such as Jerry Fisk, Wolf Loerchner or >Brian Lyttle. Others are by lesser-known or up-and-coming makers. Some are traditional to various places: a delicate dagger from tango-era Buenos Aires designed to be worn in a woman’s garter, the one from Papua New Guinea crudely fashioned from the leg bone of a cassowary, the 150-year-old Chinese executioner’s sword. Some are purely practical camping or food-prep knives by companies like Benchmade and Spyderco. Being left-handed, I’m always on the lookout for folding knives oriented that way. Sometimes a knife designed for one thing might get used for another; a combat knife doing duty in the kitchen, for instance. Actually, nearly all the knives get a bit of kitchen use, so they’re kept sharp. I have issues around my kitchen knives, insisting that they be treated with respect by any who use them. I seem to have impressed this so heavily on my daughter’s boyfriend that when he comes to visit, he brings his own knives.